I have been developing this computer software / program / application for some years now, and it is now accessible as a web page, to run in your browser. It provides basic geometric construction facilities, with lines, points and circles, from which endless possibilities follow. Just try it out, it’s free. 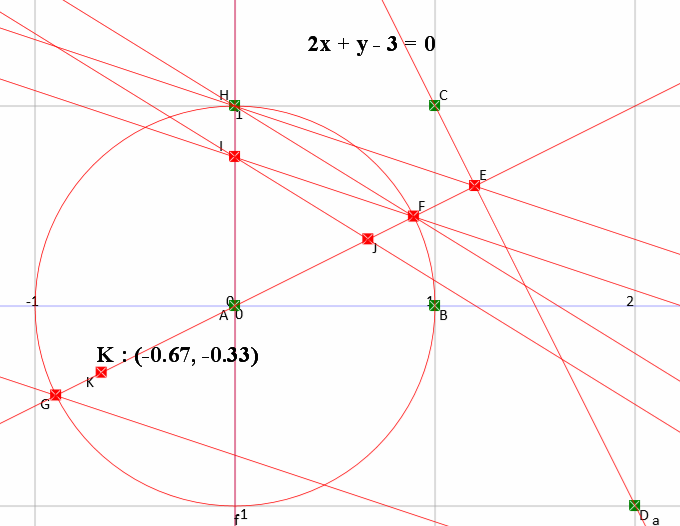 .Here are some of the basic features, and examples of more advanced constructions, almost all based on straightedge and compass, from “make line pass through a point” to “intersection of two circles”, and dynamic constructions with rolling and rotating circles. 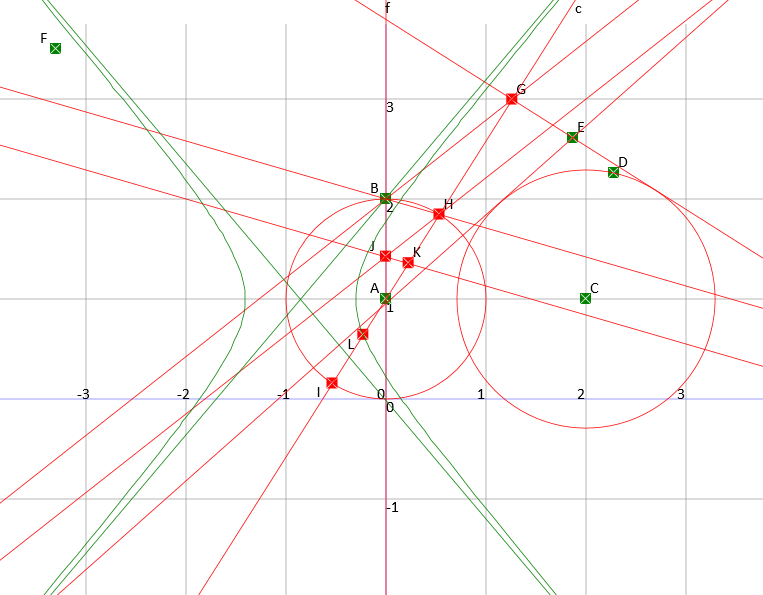 Construction for the locus of a parabola, focus-directrix definition. How come that after 55 or so years of involment with math this came as a big surprise !!!!! Duality, fundamental and profound, but here’s a starter for you. Duality, how things are connected in unexpected ways. The simplest case is that of the five regular Platonic solids, the tetrahedron, the cube, the octahedron, the dodecahedron and the icosahedron. They all look rather different, BUT….. The sizes may change, but we are only interested in the shapes. This is called a Duality relationship, in which the tetrahedron is the dual of itself, the cube and octahedron are duals of each other, and the dodecahedron and icosahedron are also duals of each other. Now we will look at lines and points in the x-y plane. The word “dual” is used in this situation. 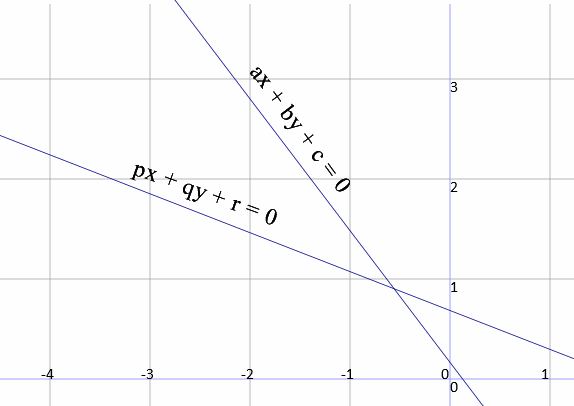 The point (p,q) is the dual of the line px + qy + 1 = 0, and vice versa. 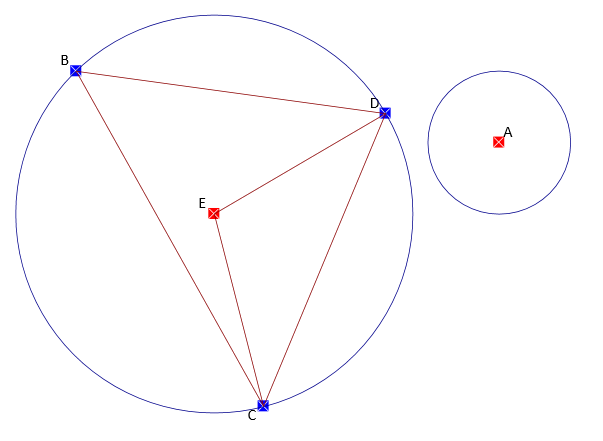 The line joining the points C and D is dual to the point K, in red. The line equation is 2x + y = 3, and we rewrite it in the “standard” form as -0.67x – 0.33y +1 = 0 so we get (-0.67, -0.33) for the coordinates of the dual point K.
A quick calculation (using the well known formula) shows that the distance of the line from the origin multiplied by the distance of the point from the origin is a constant (in this case 1). The second picture shows the construction of the dual point. What happens as we move the line about ? 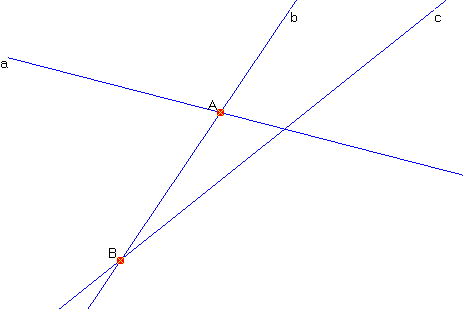 Parallel to itself, the dual point moves out and in. 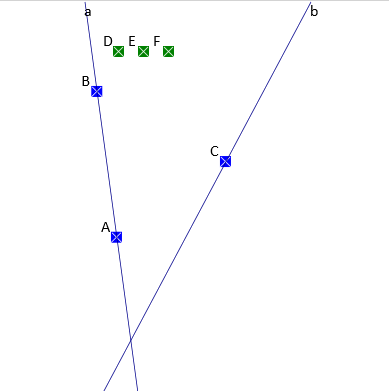 The line passes through the fixed point C. The dual point traces out a straight line, shown in green. 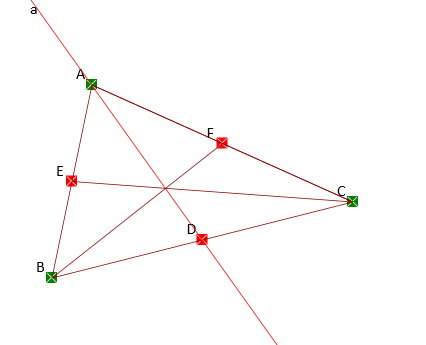 This can be interpreted as “A point can be seen as a set of concurrent lines”, just as a line can be seen as a set of collinear points (we have fewer problems with the latter). It gets more interesting when we consider a curve. 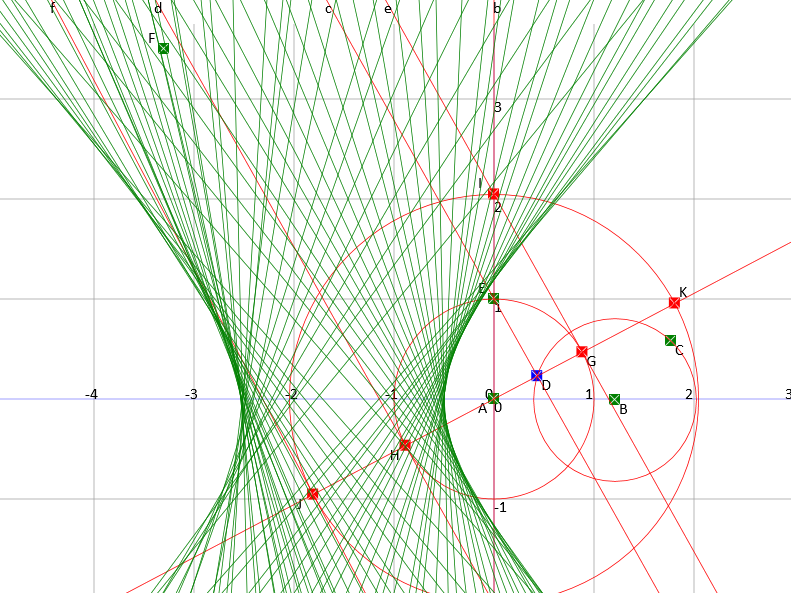 There are two ways of looking at a curve, one as a (fairly nicely) organized set of points ( a locus), and the other as a set of (fairly nicely) arranged lines (an envelope). 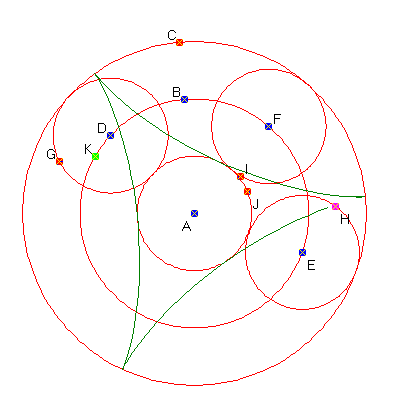 A circle is a set of points equidistant from a central point, but it is also the envelope of a set of lines equidistant from a central point (the tangent lines). 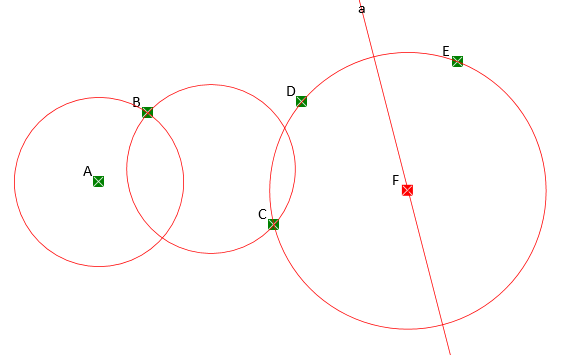 In this case the circle being dualled is the one with center C, and the result is a hyperbola, shown in green. The result can be deduced analytically, but it is a pain to do so. The hyperbola again. It doesn’t look quite perfect, probably due to rounding errors. 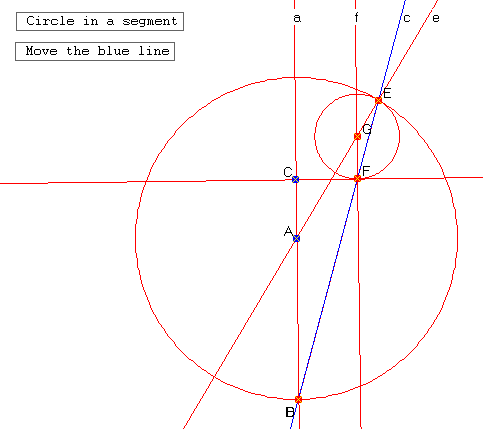 The question remains – If I do the dualling operation on the hyperbola, will I get back to the circle ? 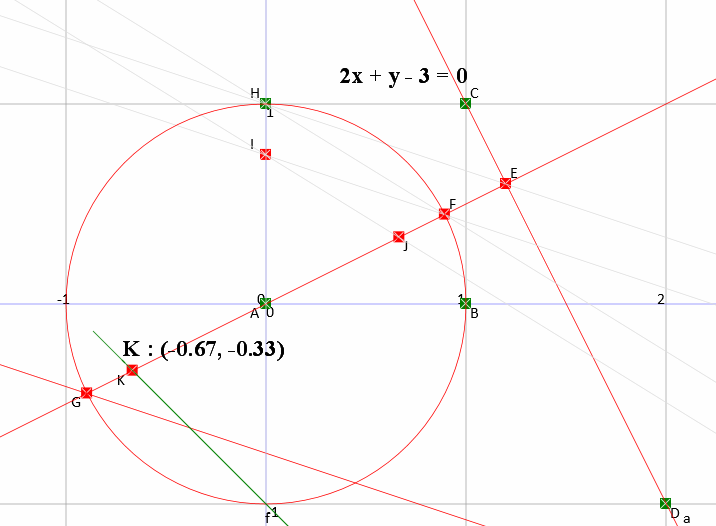 Also, why a hyperbola and not an ellipse ? 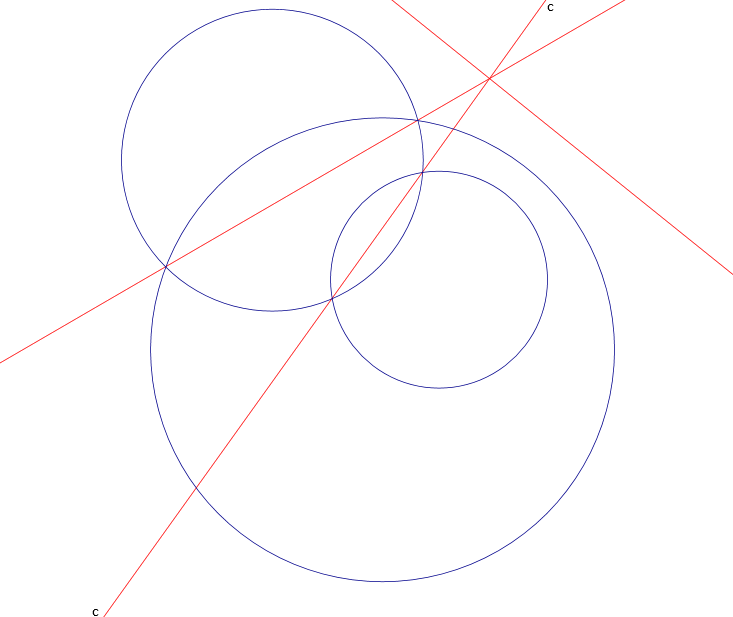 Looking at what is going on suggests that if the circle to be dualled has the origin inside then we will get an ellipse. This argument can be made more believable with a little care ! This much is so obvious, except to those who have no idea about teaching and learning. Pity they are the ones making the decisions. The odd theory of the Common Core standards is that if everyone has exactly the same curriculum and the same standards, everyone will learn the same “stuff” and progress at the same rate; and as a result, everyone will have the same results, and the achievement gap will close. If this were true, every child who had the same teachers and the same classes in the same school would have identical outcomes, but they don’t. In 2012, Tom Loveless of the Brookings Institution wrote an analysis of the Common Core standards and concluded that they would have little effect on achievement. Not because the standards are good or bad, but because standards alone don’t raise achievement, nor, I might add, do tests, which measure achievement, as thermometers measure body temperature without changing it. Loveless summarizes his 2012 findings here. What is Algebra really for ? An example tells a good tale. Take a line y = 2x -3, and translate it by 4 up and 5 to the right. 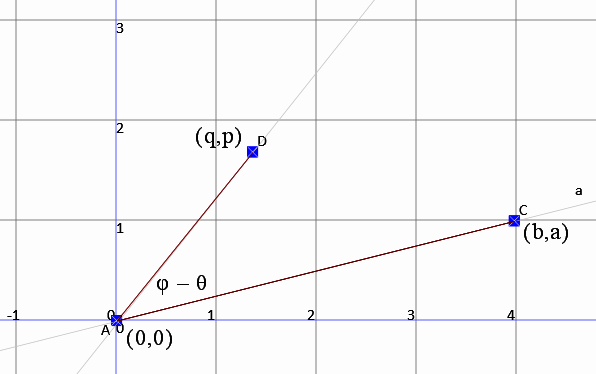 Simple approach : The point P = (2, 1) is on the line (so are some others!). 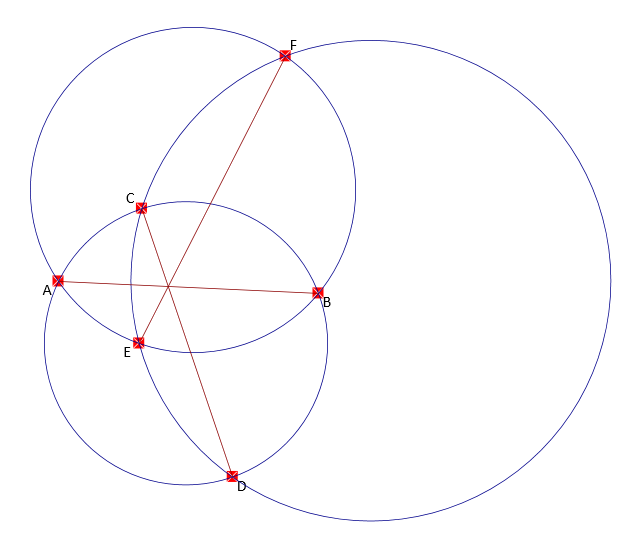 Let us translate the point to get Q = (2+5, 1+4), which is Q = (7, 5), and find the line through Q parallel to the original line. The only thing that changes is the c value, so the new equation is y = 2x + c, and it must pass through Q. So we require 5 = 14 + c, giving the value of c as -9. We try a more algebraic approach – with any old line ax + by + c = 0, and any old translation, q up and p to the right. This is where algebra comes to the rescue. Let us suppose (state) that a point P = (d, e) IS on the line. “Why did you do that last step ?” – “Because I looked back a few lines and figured that (ad + be) = -c, which not only simplifies the expression, it also disposes of the unspecified point P.
and the job is done for ALL lines, even the vertical ones, and ALL translations. Also we can be sure that we know what has happened to ALL the points on the line. I am not going to check this with the numerical example, you are ! Mercedes Schneider has transcribed Yong Zhao’s wonderful speech to the second annual conference of the Network for Public Education. This is the last of five posts; it includes links to all the previous transcritions. If you enjoy the speech, be sure to watch the video (link included), so you can see Yong’s ingenious use of visuals. Federal agents raided the homes and classrooms of hundreds of parents, teachers, and educational “advocates” today because of their involvement with the “opt-out movement.” This illegal act of defiance has cost millions in tax payer’s money and now the feds as well as state education officials are cracking down. Among the charges these people face are endangering the welfare of minors, insubordination, and churlishness. Mr. Glynn of Brookhaven Elementary School was removed earlier this morning from his school’s playground in which he was wasting valuable time for rigorous learning to play soccer with his class. It took officials a while to find him as they assumed he would be in the teachers’ lounge during his lunch break.